Firstly, apologies for the lack of posts lately, the past couple of weeks have been hectic and I haven't been feeling too great. However I have been watching as many heats and national finals as time allows, I have (surprise surprise) built up a large backlog of posts to write up since December, unfortunately I can't promise when I'll have the time or energy to get round to posting these but hoping to do this within the next 4 weeks. This blog is very much a 'retrospective' one these days, sad to say. It's Super Saturday tonight with 3 finals (Hungary, Poland and Malta) as well as various semi-finals going on. If you thought last Saturday night was a challenge then tonight is an even bigger one, trying to catch as many of the shows as possible. Good luck everyone! Anyway let's get on with a quick first listen to this week's Melfest entries competing in Växjö. Who will go direkt, who will make it to Andra Chansen and who's going home? Song 1: "I Can't Go On" - Robin Bengtsson. 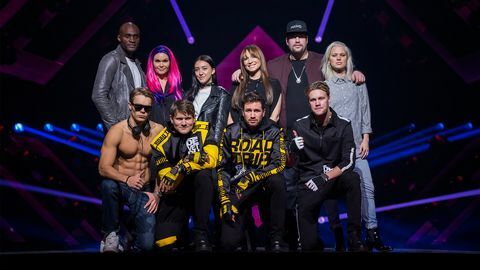 Melodifestivalen 2017 has been the year of the f word. It first popped up in week 1's opening number, then it was all over Lisa Ajax's song last week, and now here it is again in Robin's song. Now I'm no prude and I'm not a fan of musical censorship but I think it's all getting a bit tiresome now. I will probably write more about this when I get round to publishing my full reviews. In the meantime, we have Robin's quick return to Melfest with a song which on first hearing has, to be honest, left me cold. Of course I've only heard a minute of the song so maybe it gets better, and and maybe the live performance will give it that something extra. It has a little Justin Timberlake vibe to it, but apart from that and the unnecessary f-word, it all just sounds far too generic and dull. I expected something a bit more special from Robin, although having said that, it took a while for "Constellation Prize" to grow on me so this might be the same. Song 2: "Snurra Min Jord" - Krista Siegfrids. I thought Krista did an excellent job hosting the Finnish final a few weeks ago. Now she's popped over the border again to compete in another Melodifestivalen but I fear it will be another year without success. This is an upbeat dance/pop song in Swedish, and the fanboys are all loving it. For me, it's OK and I think it might grow on me after a few listens. I can't see this qualifying from the draw-of-doom slot and even in a musically unspectacular week there are other songs which have a much better chance of qualification. Song 3: "Kiss You Goodbye" - Anton Hagman. Song 4: "Gravity" - Jasmine Kara. This seems to have that 'something extra' to take it on to the final. It starts well but then it all goes wrong and goes all EDM/Titanium on us. In the current Melfest fashion for the F-word I would like to say this: "Not another f***ing Titanium copy! Can Titanium please f*** off now? We suffered it enough when it was all over the radio for about 2 years so we really don't need all these f***ing songs which sound like Ti-f***-ing-tanium in Eurovision as well. And that goes for you too Germany!" "Gravity" is not as blatant a Titanium copy as "Perfect Life" though, so that's something. Song 5: "Boogieman Blues" - Owe Thörnqvist. A man called Owe! In this case, he's Melodifestivalen's oldest contestant ever, 87 years young, and he is still rockin' and rollin' with this fun song. I still haven't a clue how this is going to go - it's probably not a qualifier but if Hasse Andersson could do it then who knows? In a heat with two acts with teen appeal though, the young voters are likely to greatly influence tonight's result. Song 6: "Crucified" - Bella and Filippa. A cheery wee country-flavoured number is this. But OMG, what a cheeky steal from the Common Linnets' staging, with the road line going down the middle of the stage. There's a lot of comparisons with First Aid Kit, although Bella and Filippa seem to be a more mainstream/commercial version. This is very nice, but it's maybe too lightweight to make enough of an impression with the voters. Song 7: "Gotta Thing About You" - FO&O. Right then, Firstly, have this band got the monopoly on stupid band names? Firstly we had The Fooo. Which was at least quite funny as we could call them "The Foooooooooooooooooooooooooooooo". Then they changed to the rather silly The Fooo Conspiracy. Finally when they lost a band member (an O) they changed it yet again to FO&O. Which is a pretty rubbish band name really. They are hugely popular in Sweden with a very enthusiastic fandom to say the least. Despite the heavyweight songwriting input from Mutt Lange, something is missing here for me. I expected a stronger song but it just sounds like something else off the boyband production line. It's JTR all over again. The biggest, most popular, most hyped of all the Eurovision national selections kicks off tonight in Gothenburg. Yes, Melodifestivalen is finally here. However I am taking a very different approach to it this year and have lowered my expectations so that I won't be disappointed! My problem with Melfest is that every year I get carried along with the hysteria and end up expecting far too much, only for the inevitable disappointment to follow. If we're all spared and make it to the end of 2017, some of this year's Melfest entries may make it into my annual chart, but at this stage of the game it's likely to be a very different story. Let me explain! Very few songs manage to grab me on first hearing, so I can become quite negative about songs which I eventually grow to like or love. Anyway it's time to look at the first set of songs which will compete to go either direkt till final or to Andra Chansen. As usual SVT published snippets of the songs the other day, so here are my views based on what I've heard so far. Song 1: "Her Kiss" - Boris René. His debut entry last year "Put Your Love On Me" remains one of my favourite songs from 2016's national finals season. 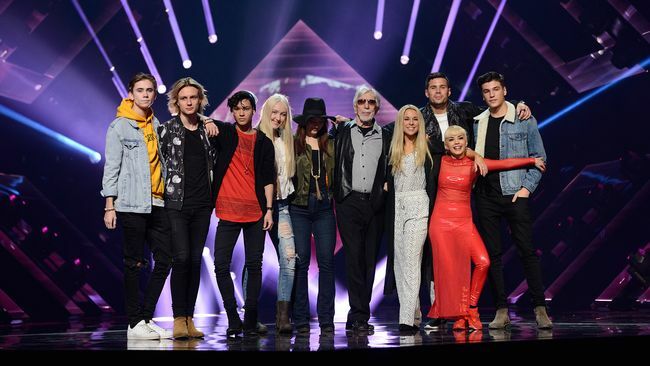 I fear though that Boris may be subject to Melodifestivalen's Law of Diminishing Returns - where returning artists bring a song which just isn't as good as their previous entry. It's not a serious contender though, and people may struggle to remember the song, but he's a likeable performer and all in all I think it'll be enough to ensure a qualifying place. Song 2: "Amare" - Adrijana. Oh no, second position in the running order, the 'slot of death' for unknowns, newcomers and the acts which SVT don't want to qualify. I can't see Adrijana breaking this curse. This is a very contemporary hip-hop song but it lacks a strong hook and is easily forgotten. This isn't really my type of music but extra points from me for it being in Swedish. Song 3: "One More Night" - Dinah Nah. So Christer says that there is no schlager in this year's Melodifestivalen. Well to these ears, this song has a definite whiff of modern schlager about it and if you're one of those fans who like to regularly use the words "yaaasssss", "slay" and "queen" when referring to song contest entries, then this one's for you. It has a touch of the 'Bombo' about it as well. However, times have changed and songs like this just don't do well in Melodifestivalen any more. Song 4: "Road Trip" - De Vet Du. Song 5: "Mitt Liv" - Charlotte Perrelli. The schlager world went into mourning at the news that La Perrelli was returning to Melfest with *a ballad*. And - shock horror - am acoustic guitar! I'm not a fan of ballads and it has to be particularly memorable to stand out. I found this rather dull and it's quite likely to be down near the foot of the scoreboard. I doubt whether Charlotte will care too much though as she will solely be using this appearance as a promotional tool for her new style of music. Song 6: "Wild Child" - Ace Wilder. Will it be third time lucky for Ace this year? Despite the title it's not that wild at all, and it actually shows a 'softer' side based on this clip. I don't like her new platinum blonde hair colour though! She is not the strongest vocalist, it has to be said, and the overall staging and presentation of the song has been such a huge factor in the success of her previous Melfest entries so I guess a lot will depend on that. She could even find herself battling against De Vet Du for that final spot - but I think she'll make it to the final based on the name-recognition and her past successes in the contest. Song 7: "Hold On" - Nano. Much has been written over the years about the power of the "pimp slot" which is usually reserved either for a much-hyped well-known 'name' or as a launchpad for an unknown artist. Many were surprised when the previously-unknown Nano was given week 1's "pimp slot" in preference to Ace Wilder. If you had to put Hozier's "Take Me To Church", Rag N'Bone Man's "Human", Sigma & Rita Ora's "Coming Home" and Rudimental's "Feel The Love" into a blender, it would probably produce this on-trend, generic recipe for success. Mix that with his strong, powerful vocals and this is an absolute qualifier without a doubt.